Oregon is generally known for rain, mild temperatures and gray, cloudy skies during the winter months. This winter weather nurtures the fertile Willamette Valley’s famous grapevines and the nearby coast of the Pacific Ocean gives sanctuary and food to migrating whale populations. It’s the perfect time to grab your binoculars, camera and a raincoat and enjoy a road trip. Take your time and slow down this season to enjoy cozy wine country and the wave crashing views along the Oregon Coast. Pick up a rental car at the Portland Airport and head 90 minutes south to the college town of Corvallis, home to the Oregon State University. Take your time to walk the campus or visit downtown for boutique tax-free shopping. Grab a bite at local favorites like Block 15 Brewery, known for its creative sour beers and traditional pacific northwest IPAs, or Taco Vino for their unique street tacos and build-your-own guacamole. If you would prefer, pick up a picnic lunch to-go from New Morning Bakery to enjoy it in the serene wetlands of the William L. Finley National Wildlife Refuge. Known for its winter birding, walk along the various trails to find flocks of geese, ducks and swans - you may even spot a bald eagle. After birding, take the scenic route back to Corvallis and stop in Philomath. Weekend days, enjoy a wine sampling from Spindrift Cellars or grab a glass of mead at Nectar Creek. Nectar Creek has great dinner options, or head to the Courtyard by Marriott Corvallis. 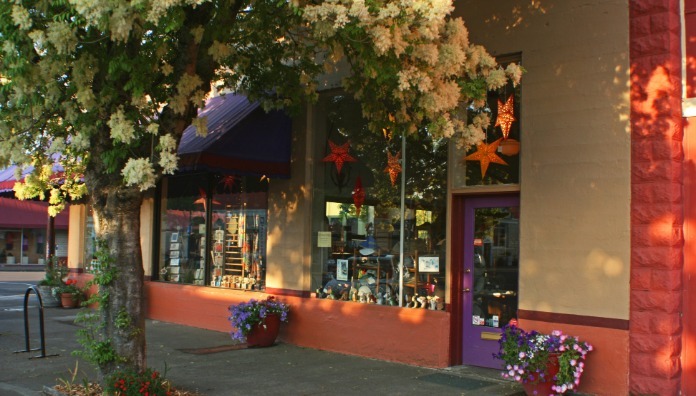 Downtown Corvallis has great dinner options walking distance from your hotel. Big River Restaurant and Bar brings the flavor of the Willamette Valley to your plate with local organic ingredient or enjoy Asian fusion plates at Magenta. 👉 Find more things to do in the Corvallis area. Breakfast in Corvallis can be quick and quirky like a donut from Benny’s Donuts or the casual bustling breakfast favorite Broken Yolk Cafe. For a locally-roasted cup of Bespoken coffee pick up a cup for the road at Tried and True before leaving town. 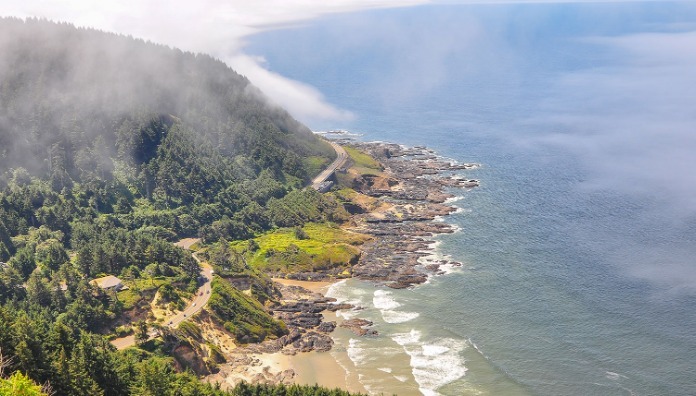 Make your way toward the Oregon Coast via Highway 34, the Marys Peak to Pacific Scenic Byway. 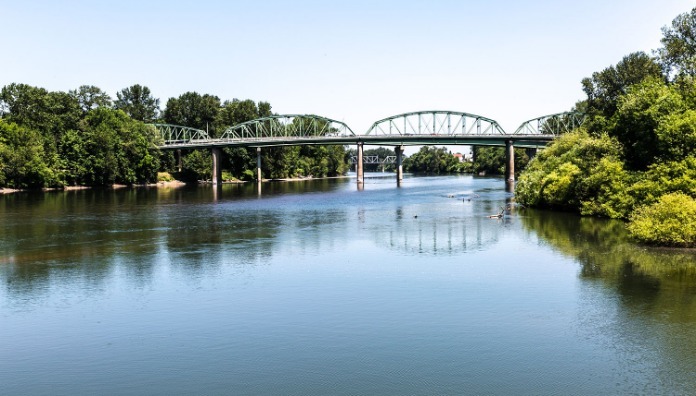 This 72-mile (116km) tour takes you from the Willamette Valley along the twists and curves of the Alsea River Valley to the sandy and scenic central coast. As you head toward the coastal town of Waldport, along the byway, you can stop and get your first peek of the Pacific Ocean from the top of Marys Peak Day Use Area. Marys Peak is the highest mountain in the Coast Range with full 360-views from the Pacific Ocean to the Cascades. Rolling fog can coat the Coast Range valleys during winter sometimes obscuring the ocean view, but the light dusting of snow on the peak makes it a beautiful nature scene nonetheless. 💡 Travel Tip: Have some cash on hand; Marys Peak requires a $5 parking fee. Once you hit Hwy 101, head south to Florence, home to over 40 miles of coastal dunes in the Siuslaw National Forest. The forest has plenty walking trails for wildlife viewing and birding, or for a more rugged adventure, hop on a dune buggy ride. 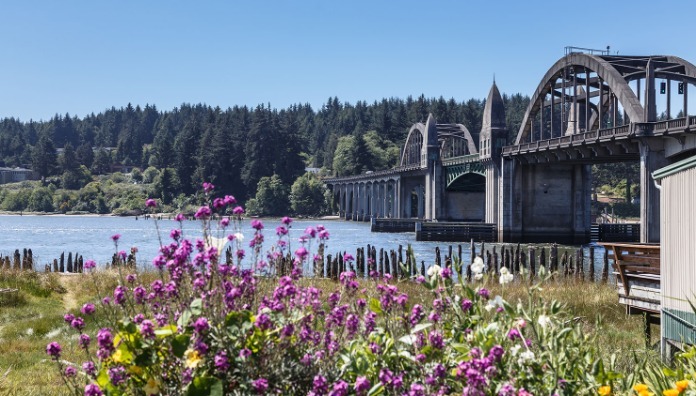 Watch sunset in Historic Old Town Florence from behind the Siuslaw River Bridge built in 1936. After the sun goes down, walk to dinner at one of the many great restaurants in old town: Waterfront Depot Restaurant, an urbane riverside bistro offering upscales takes on American fare; Bridgewater Fish House and Zebra Bar, offering eclectic seafood plates; or 1285 Restobar, an italian cafe offering pizza, pasta and seafood. After dinner check in at beachside Driftwood Shores Resort. 👉 Find more things to do in the Florence area. Eat breakfast beachside at the hotel’s Surftide Restaurant. After breakfast, just steps from the restaurant, go for a whale watching walk along Driftwood Beach. Next stop: the Sea Lion Caves. Take an elevator ride 200 feet (61m) down into a cave as tall as a 12-story building and as wide as a football field. During the fall and winter barking sea lions lounge around inside the cave's natural amphitheater. As you meander your way north, stop halfway to Yachats at the historic Heceta Head Lighthouse. Stop under the bridge over Cape Creek, where it meets the ocean attracts hundreds of Western gulls bathing in the water. Bring your binoculars when you take a tour of the lighthouse and look for whales from 205ft (63m) above the ocean. Another whaling view point on the way to Yachats is Cape Perpetua. At 800 feet in elevation, the lookout provides a 70-mile view of the Oregon coast on a clear day. Additionally, the unobstructed view out west over the Pacific allows visitors to see more than 35 miles out to sea. Cape Perpetua is also part of the Cape Perpetua Marine Reserve and Marine Protected Areas. You can’t go wrong with dinner at the Drift Inn in Yachats. The menu is an eclectic mix of family favorites and original dishes focused on fresh ingredients from the Pacific Northwest. After dinner, walk up the block for a nightcap at Yachats Brewing + Farmstore. After dinner, head to the Overleaf Lodge. In the morning, watch some of the best wave crashing on the Oregon Coast while drinking your morning coffee on your room’s private patio - don’t forget to keep an eye out for whale spouts! 👉 Find more things to do in the Yachats area. Whale and wave watch over breakfast at Yachats' Ona Restaurant. After breakfast, stop at the Green Salmon to get a cup of coffee for the road toward Newport, home to the 130-year-old Yaquina Head Lighthouse, built in 1872. You can take a tour of Oregon’s tallest lighthouse guided by Bureau of Land Management staff. Newport's also known for historic Nye Beach, a centrally-located beach with easy parking. it's the perfect spot to take a stroll along the beach and watch for whales in the bay. Enjoy the boutique shopping at Nye Beach and warm up at the Chowder Bowl with a bowl of their famous clam chowder. After lunch, travel north on Highway 101 to Depoe Bay, the whale watching capital of the Oregon Coast. Oregon State Parks and Recreation has a Whale Watching Center with staff available to answer any whale related questions. If you’re visiting December or January, you will likely see at least one of the nearly 20,000 gray whales migrating south for winter. Spring whale watching, which happens around March, showcases the gray whales returning as they travel back to Alaskan waters. Depoe Bay has a great main street with local shops and boutiques right on Highway 101, with another overlook for whale watching. For dinner visit Tidal Raves. Chef Jon Hamlin, a graduate from the Culinary Institute of America in New York, serves pacific northwest seafood with restaurant views over the ocean. 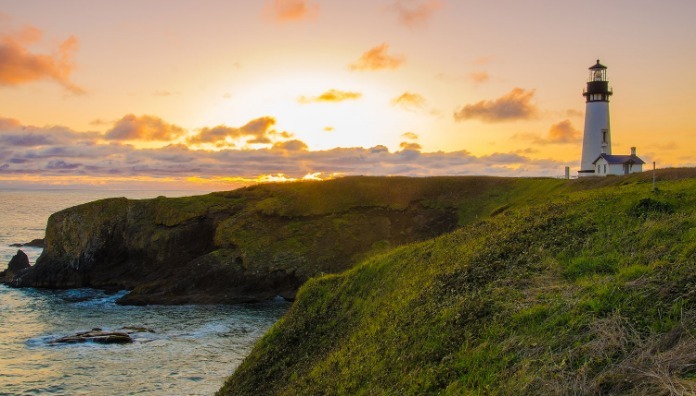 Continue north to Lincoln City to stay at the Inn at Spanish Head, where you can enjoy an oceanfront view to whale and storm watch from the comfort of your room, or head down to enjoy a glass of wine at the oceanfront restaurant and bar, Fathoms. 👉 Find more things to do in the Lincoln City area. Enjoy breakfast at a local hot-spot, the Wildflower Café, an old house-turned-restaurant specializing in made-to-order plates. After breakfast, head to Siletz Bay Wildlife Refuge for a bird watching walk. Common bird sightings at this refuge include the Western sandpiper, red-necked phalarope, waterfowl, and green-winged teal. After the refuge take your last stroll along the Pacific Ocean at the Roads End Beach before making your way back toward the Willamette Valley via Highway 18. On your drive you will travel through the Van Duzer Forest Scenic Corridor and the newly designated American Viticulture Association (AVA), Van Duzer Corridor AVA. Visit Chateau Bianca to sample the distinctive wines known for their signature terroir of marine sediment with a top layer of basalt. Pinot noirs in this AVA are darker and richer due to grape skins that are thickened by cool pacific winds. For another birding opportunity, stop at Baskett Slough Wildlife Refuge near Dallas. 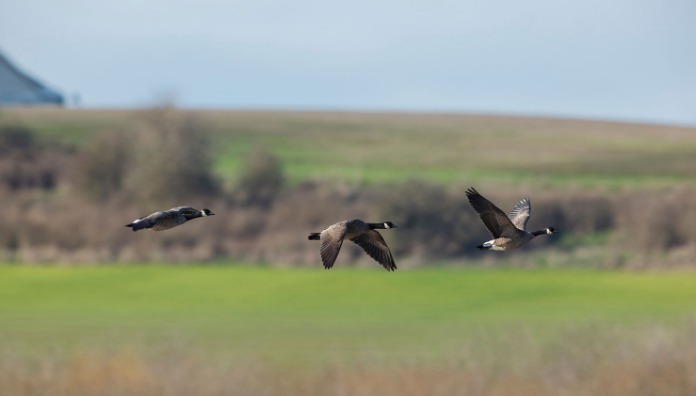 Baskett Slough hosts over 200 species of birds for winter as nesting or migration stopovers. The diversity in habitat demonstrates an array of birds to see, from shorebirds and waterbirds to songbirds and raptors. Continue on to Amity, the gateway to the Eola-Amity AVA and a few short miles to McMinnville and the Evergreen Aviation Museum. In Amity, pick up a sandwich or snack at Blue Raven Farmstand, then head down the road to Keeler Estate Vineyard for spectacular wine and to learn about biodynamic and sustainable grape farming practices. Have dinner at The Blue Goat on Amity’s Trade Street, specializing in seasonal, local and sustainably-farmed produce from the Willamette Valley. After dinner, walk down the block and check in at the Amity Flats to stay in a charmingly restored loft. 👉 Find more things to do in the Yamhill area. 💡 Travel Tip: You can travel through Salem to get to Albany. 👉 Find more things to do in the Salem area. In the morning, grab a waffle and espresso for breakfast at the Common Cup then make your way south toward historic downtown Albany, boasting more than 800 historic structures in a 100-block area. After exploring the historic homes and buildings, experience the first framed structure built in Albany in 1849, the Monteith House. Across the street, take a ride on a hand-carved animal at the Historic Carousel and Museum. Community volunteers hand-carved each of the one-of-a-kind carousel animals. Each animal takes over two years to complete. Soon you'll be able to ride a new creation: the orca whale, Geno. Stop for lunch at Novak’s, Oregon’s longest running family-owned Hungarian restaurant, before making the 50-minute drive to Eugene. Eugene, known as TrackTownUSA, is home to the University of Oregon. While on campus, be sure to visit the National Medal-winning Museum of Cultural and Natural History. After the museum, stop in at the urban winery, Oregon Wine LAB, to sample their private label William Rose Wines or other local artisan craft drinks. Dinner choices in Eugene are nearly limitless. Keep it casual in The Whit with street tacos at Tacovore or exceptional sandwiches and beer at Falling Sky Delicatessen. To splurge on yourself, go downtown and enjoy locally sourced menus from Marche, Rye or Oregon Electric Station. Check in at the Hyatt Place, one of the newest hotels in the area. The SkyBar is a great place to unwind after a long day. 👉 Find more things to do in the Albany area. 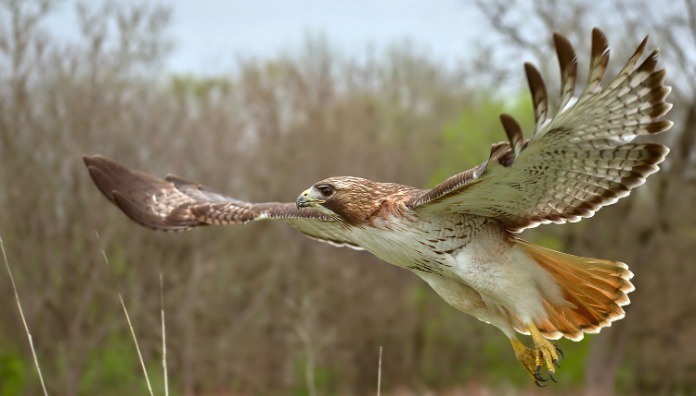 Grab a woodfired breakfast at Hideaway Bakery and head to the largest collection of native raptor birds in the Pacific Northwest at the Cascades Raptor Center. At the center, you’ll get to see staff working with rescued raptors. Raptor Center Staff will bring birds out of enclosures to educate and allow for a closer, unobstructed view of the bird. 💡 Travel Tip: At the Cascades Raptor Center you can book a private tour ahead of time or take a self-guided tour though the property. 👉 Find more things to do in the Eugene area. If you have more time in the Eugene area, do some wine tasting along the Territorial Wine Trail at Sweet Cheeks Winery, Iris Vineyards or Sarver, near Fern Ridge Reservoir, the Willamette Valley’s largest body of water and an exceptional birding site. An important fly-way for migrating birds, Perkins Peninsula, offers easy access to trails, lookouts and viewing platforms. The Eugene Airport is 30 minutes from Cascades Raptor Center. Or, if you are flying out of Portland, Portland International Airport is approximately 2 hours and 15 minutes away. If you want to stay in the Portland area longer, stay at the Best Western Wilsonville Inn. From Wilsonville, on a weekend day, visit the quaint town of Aurora to taste at Pheasant Run Winery in the old Aurora State Bank. The bank building was built in 1905 as part of the Portland World’s Fair and moved to its current home after the exposition. 👉 Find more things to do in the Wilsonville area. This itinerary was created in partnership between the Oregon Coast Visitors Association, the Willamette Valley Visitors Association and VisitUSA Parks. Andi Fischer of MissAdventures with Andi got to experience this trip first hand and you can read about her experience here.